A book to empower and teach children about personal body safety, feelings, safe and unsafe touch, private parts, secrets and surprises and respectful relationships. Also includes Discussion Questions to enhance learning and initiate important conversations around body autonomy. 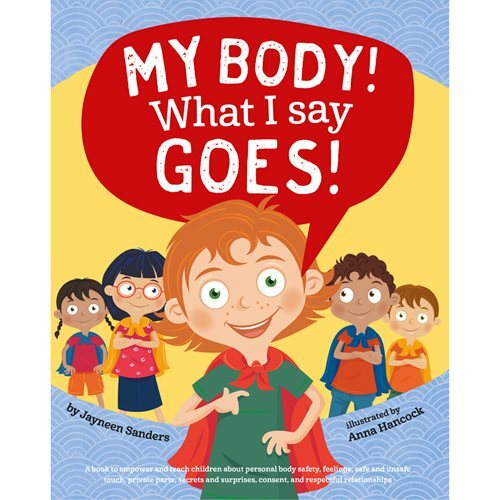 The crucial skills taught in this book will help children to protect their bodies from inappropriate touch. Children will be empowered to say in a strong and clear voice: "This is my body! What I say goes!" Approximately 20% of girls and 8% of boys will experience sexual abuse before their 18th birthday (Pereda, et al, 2009). Parents, caregivers, and educators have a duty of care to protect children by teaching them Body Safety skills. These skills empower children, and go a long way in keeping them safe from abuse - ensuring they grow up as assertive and confident teenagers and adults. Also included in this book are in-depth discussion questions to further enhance the learning and to initiate important family conversations around body autonomy.